We offer a warm and caring home from home service, with a large comfortable living space; we have a sand and water play area outside, a messy play/eating area inside. A large playroom, with lots of different areas, small world play, Reading area, construction area, music area, and Kitchen Area. A large grass garden area with a mud kitchen, swings, see saws, football nets, a wild garden area which attracts, insects, bugs and frogs in different seasons. In order for older children to relax, we have a designated area in our living room with comfy cushions, books and games or a small amount of television or DVD time in order to recharge after a hectic day at school. Children in our care will benefit from a wide selection of activities, including plenty of age appropriate toys, books and craft activities, with supervised access to learning tools on the home computer. Within our setting, we have access to sand and water play, dressing up costumes, as well as the standard toys, books and games. We attend numerous social and toddler groups and undertake trips to local parks, zoos, museums and activity centres, where your child has the opportunity to experience and interact with the world around them. These outings are included within our prices subject to a maximum of £5 per trip; sums over and above this will be invoiced prior to the outing. Evening meals can be provided for an additional £2 per day. 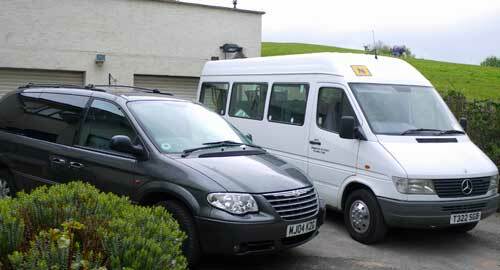 We have three modes of transportation – a Rav 4, a 7-seater Chrysler Voyager and a 15-seater Mercedes Minibus; all are fully insured with MOTs and Business Insurance. Please remember that during the day we will be going outside, so your child may get dirty, please take this into consideration when dressing your child for the day (you may wish to send a set of spare clothes with them) do not dress them in anything that you would not want them to get dirty. The children will be playing out in all-weather so they can experience the different seasons, so please provide appropriate clothing. If your child is attending my setting after school and you would like them to change then please send them with a change of clothes. The EYFS (Early Years Foundation Stage) puts a great focus on the importance of outdoor play for children of all ages. We have two undercover areas outside for if the weather is bad the children are still able to get fresh air, whilst protected from the elements, we have lots of outdoor provisions on offer, we have a messy play area which has invaluable learning opportunities for your child, we have scooters, bikes and a police car to play on. Your child will have periods of time outside whilst at our setting , irrespective of the weather. Outdoor play is so important, we will take indoor activities outdoors as well. Being outside allows children to develop skills which are not safe to do inside, providing opportunities to run, climb, dig, balance and throw. We will obtain written parental permission for all routine and special outings. We will inform parents of any costs well in advance. Please see our safety on outings policy. Risk assessments will be carried out on any outings that we have, the health and safety of the children is our priority and all safety procedures will be in place and all contact numbers carried with us.